You are about to read a slave narrative—a first-hand written account of one person’s experience of slavery. Take a moment before reading and write down what you think slave life was like during the 19th century. Then, read the Narrative of the Life of William W. Brown, which was published in 1847, just two years after another well-known slave narrative: The Narrative of the Life of Frederick Douglass (1845). Narrative of the Life of William W. Brown, available via the EDSITEment-reviewed Documenting the American South website. Master and Slave Relationship: Much of Brown's narrative portrays the harsh treatment of slaves by their masters. Look for incidents in which the relationship between slave and slaveholder is more complex, revealing an element of understanding on both sides. How do these glimpses of relationships between slave and master reflect on those episodes which exhibit the slaveholder's cruelty? Resistance to Slavery: Focus on evidence of resistance to slavery in Brown’s narrative. How do these incidents of resistance add to our understanding of slave life? After you finish the narrative, return to your thoughts on slave life—how does Brown’s narrative compare? What had you not thought of? Read the following brief article from the EDSITEment-reviewed website Digital History. What was Life Like Under Slavery? Slave narratives were often key elements in strategies to abolish slavery. For a brief introduction to the abolitionist movement, visit Digital History’s articles on the topic. Rhetoric from groups both for and against abolition could get heated, mean, and outright racist. Use the EDSITEment interactive tool (requires Flash) to review four cartoons and decide if there are Pro- or Anti-Abolition. Explain why you think so in the space provided in the interactive tool. Those with computers who have difficulty with Flash can explore the same images at the EDSITEment-reviewed Uncle Tom’s Cabin & American Culture website and use the NARA Document Analysis Worksheets as a guide to reading the image. After reviewing the images, reconsider the role of Brown’s narrative in the cause for abolition. EDSITEment Interactive: Pro- or Anti-Abolition? "A punishment practiced in the United States . . ."
3. What evidence can you cite for your answer? Look also at Brown's portrayal of slaveholders, in particular his comments on their piety. What does he say about his master's sudden enthusiasm for prayer and church-going (Chapter 4, pages 36-38)? About the family prayers of those who captured him on his first attempt at freedom (Chapter 8, page 71)? About the auctioneer's cry that a slave "has got religion" (Chapter 9, pages 82-83)? 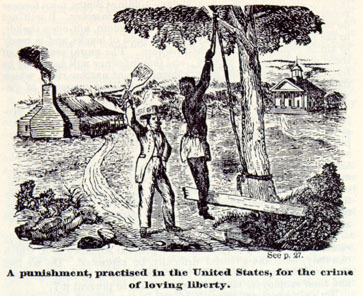 How would these moral attacks help persuade a white reader to oppose slavery?